A team of Malaysian businessmen interested in investing in the Maldives through joint ventures with local businesses arrived in the country yesterday (November 15). Maldivian High Commissioner to Malaysia Mohamed Fayaz told local media that the team includes 17 potential investors from the Chinese Chamber of Commerce of Malaysia. Fayaz said the businessmen had expressed interest in investing in guest house tourism, fisheries, construction, export and import, and real estate and would be meeting with the Maldivian Chamber of Commerce, the economic development minister and local businesses during their three-day visit. The current administration should carefully consider how far and wide the country’s doors should be opened to foreign investors in order to protect economic independence and sovereignty, Home Minister Umar Naseer has said. In his speech at a flag-hoisting ceremony held last night to mark the 49th Independence Day, Naseer said tactics to “enslave” nations in the present day involved infiltration of the economy and “ideological warfare”. “[But] the happy news is that the policy of the current government is very clear,” he said, adding that President Abdulla Yameen’s administration would ensure that independence and sovereignty are protected when economic zones are created to attract foreign investors. The property and assets of the Maldivian people would be preserved, he said, while the government would also ensure that necessary “restrictions” are in place when the special economic zones are established. President Abdulla Yameen has held meetings with prominent businessmen, economists, and industrialists during his current state visit to Japan. Yameen has held meetings with the senior figures at the Japan Bank for International Cooperation (JBIC) and the Japan International Cooperation (JICA), as well as tourism and business leaders – including the president of the Hitachi company. The second day of the president’s visit also saw a meeting with Japanese Minister for Internal Affairs Yoshitaka Shindo, with the prospect of a Japanese embassy in the Maldives being discussed. In his meeting with the JICA governor Hiroshi Watanabe, Yameen discussed means of obtaining funds for various development projects in the Maldives. The president broached the subjects of financial assistance for the Maldives airport development project, as well as a project to be focused on the island of Ihavandhihpolhu. He further thanked the Senior Vice President of JICA Hidiaki Domicia for the assistance that JICA has extended in the implementation of projects in the Maldives under the aid of the Japanese government. As the coordinating body of Japan’s overseas development assistance, JICA oversaw projects worth US$450 million to the Maldives in development assistance between 2004 and 2010. Projects benefiting from Japanese aid have included the first mechanisation of fishing vessels between 1973-76, the development of Malé’s seawall between 1987-2003, and the extension of loans amounting to US$34 million for post-tsunami reconstruction. During a meeting with Hitachi’s President Toshiaki Higashihara yesterday, Yameen thanked the company for its cooperation with the State Trading Organisation and for its interest in energy-related projects in the Maldives. Yameen also met with leaders of the Japanese tourism industry, including senior officials from travel agencies, travel publications, tour guides, and the media. After providing information about current tourism development projects in the country, Yameen noted that the Maldives’ global recognition as a high level tourist destination made it one of the most beneficial areas in which foreign businesses can invest. The president also noted the need for foreign assistance to further develop the tourism sector, reasserting that the current atmosphere in the country is peaceful after some political turbulence at the time of his taking office. Yameen assured investors that the Maldives is currently in the collective mindset of overcoming differences, maintaining peace, and promoting development. President Yameen also attended a forum titled ‘Maldives Investment Promotion Forum’ – organised by the Japan External Trade Organisation, and attended by senior businessmen of the country. Thanking investors for their interest in the country, Yameen provided details of investment opportunities currently available in the Maldives. According to the President’s Office website, he highlighted that the current government’s intention to introduce numerous incentives for foreign investors in a bid to further strengthen the country’s economy. Earlier this month, Yameen revealed that legislation will be proposed during the next parliament which will create special economic zones, will he feels will be “likened to cities in Dubai or the Emirates”. The new laws would enable investors to have “freeholds” in the country and allow investors “to engage in really, really long gestative projects,” he told investors. “We are going to open up the Maldives in a huge way to foreign investors. Our thirst cannot be quenched. The opportunity to foreign investors is going to be enormous. So have faith and trust in us,” Yameen said. The president has continued to outline future investment opportunities in the country to Japanese investors this week. The areas he mentioned include the handling of incidents that arise due to natural disasters, environmental protection, education, health, youth empowerment, sports, agriculture, human resources, security, and infrastructure development. Together with President Yameen, Minister of Economic Development Mohamed Saeed, and Minister of Tourism Ahmed Adeeb also attended the investment promotion forum. Saudi real estate investment and development firm Best Choice has announced plans to develop a US$100 million resort on Vadinolhu island in Laamu Atoll. “We are negotiating with investors, and we are looking for more,” Best Choice CEO Mohamad Rabih Itani told Minivan News today. “Our aim is to develop Vadinolhu Island as a high-end resort with world-class facilities to promote it as a complete family destination,” Itani explained in a company press release. With headquarters in Bahrain, Best Choice – formed just last month – also has offices in Turkey and the Maldives. The company’s owners, however, have been active in the Maldives for a number of years, Mitani told Minivan. Established by Saudi investors, the group currently specialises in properties in Italy and Spain, as well as selling mixed-use projects in Turkey and residential developments in Saudi Arabia. Saudi Prince Salman bin Abdulaziz is scheduled to visit the Maldives this week, and ties between the Arab state that the Indian Ocean archipelago have been growing under the presidency of Abdulla Yameen. Headlines in Saudi Arabia have suggested that Prince Salman will discuss potential investments and partnerships in energy, tourism, transport, and Islamic affairs, as well the provision of a soft loan facility of US$300 million for the Indian Ocean nation. President’s Office Spokesman Ibrahim Muaz today said that prince’s visit is still due to take place, and that Prince Salman will meet with President Yameen during his stay. When asked about Best Choice’s links with the Saudi royal family and the increasing relations between the two states, Mitani stated that the timing of the resort announcement was “pure coincidence”. The proposed resort, reported to feature 100 beach villas, world-class dining services, wellness facilities, and leisure activities, a Best Choice press release has stated. The resort is expected to be completed by 2017. “We have already designed a business proposal targeting potential investors to collaborate with us in the operation and management of the resort. We are confident of achieving an operating profit in the second year with the cash payback period at six years,” Mitani explained. Best Choice’s press release describes the Maldives as “one of the most recent investment destinations in South Asia”. “Due to its investment-friendly policies, the South East Asian Island offers attractive opportunities to keen investors – especially those into resort management,” read the release. The Yameen administration has sought burnish the country’s credentials as an attractive place to invest after the premature termination of Indian company GMR’s deal to develop the international airport in late 2012. Although Yameen’s Progressive Party of Maldives – part of the governing coalition at the time of GMR’s expulsion – includes many vocal opponents of the GMR deal, the party has since distanced itself from the decision. Reassuring foreign investors of the safety of the Maldives as a destination for investment was recently announced of one of the main aims of the administration’s foreign policy. The Maldives brand of luxury tourism currently accounts for 70-80 percent of the country’s GDP, with the IMF noting recently that investors in the Maldivian resorts can expect a quicker return on investment than in similar resort industries. The industry attracted over 1.2 million tourists in 2013. The IMF delegation also noted that, despite plans to increase tourist goods and services tax to 12 percent later this year, the Maldives tourism industry was still only lightly taxed in comparison to other destinations. “Reputation, reputation, reputation! O! I have lost my reputation. I have lost the immortal part of myself, and what remains is bestial. My reputation, Iago, my reputation!” said Cassio in Act II of Shakespeare’s Othello. So did Maumoon Abdul Gayoom almost every day whenever before 2008 whenever his government wanted to stymie any criticism from anyone that he didn’t count as a supporter. So did Maumoon Abdul Gayoom in June 2010, when the New York Times published the now (in)famous “looters” article and when Miadhu decided to reprint it. So did Mohamed Nasheed in January 2012, when DQP’s Dr Mohamed Jameel alleged Nasheed was working under the influence of “Jews and Christian priests”. These three moments/phases define the journey of defamation laws in our country and reflect three aspects of the maturity and adequacy of these laws. They reflect “the good, the bad and the ugly” of defamation laws in the Maldives and underlie the case for further refinements in these laws for us to have a stable, progressive and a coherent Islamic society. Evolution of defamation laws in our country has come a long way from the times where it was a criminal offence punishable with up to six months of jail under Gayoom’s era. However, they seemed to have been too weak and toothless under Nasheed, and this in some sense led to his downfall that ushered in a volatile political environment for the last one and a half years. The purpose of laws is to not just to punish actions that are undesirable for the peace of society but to also deter actions that can potentially harm such peace and harmony. This is especially true of defamation laws, which must create the fine balance between promoting responsible freedom of expression and providing enough deterrents against slander that can do unreasonable harm to reputation of individuals and to the cohesion of societies. It is worthwhile to look back at how the defamation laws have evolved over time in the Maldives and reflect on whether we need to revisit these laws going forward, in order to make them more effective in serving the purpose that these laws are supposed to serve. Before defamation was decriminalised in November 2009, defamation was one of the most abused laws in the Maldives. Section 125 was invoked by Gayoom administration every now and then to put their opponents under arrest and stymie any criticism of the government. Section 125 stated that “Where a person makes a fabricated statement or repeats a statement whose basis cannot be proven, he shall be punished with house detention for a period between one to six months or fined between Rf25 and Rf200”. This of course reflected “the ugly” of our defamation laws and was dropped by the newly elected democratic government of Mohamed Nasheed. Such decriminalisation was hailed as a key democratic reform of the previous government and was appreciated by global rights watch bodies such as Article 19 and Freedom House as well as the United Nations itself. This was a significant movement for a society that was used to being under the shackles of the government and was enjoying its now-found ‘democratic society’ status. Then, in June 2010, Gayoom decided to take Miadhu to court for reprinting an article published in New York Times. This article, which spoke of how money from the exchequer was inappropriately used for personal consumption under Gayoom’s regime, was based on the Nasheed government’s audit reports of Gayoom regime’s expenditure. This defamation suit was to be a watershed moment in democratic evolution of the country where a newspaper carried a story, which they believed to be credible, fearlessly. This was also a landmark moment with respect to freedom of expression and media in the Maldives; it was also the first case that Gayoom had lost in 32 years in the country! It showed Maldives to be on the right path of socio-judicial democratic reforms where some of the key tenets of globally accepted defamation regulations were shown to be working in our system. However, this was soon followed by how ‘the bad’ of our defamation laws were exposed after ex-DQP leader and now-running-mate of Abdulla Yameen, Dr Mohammed Jameel Ahmed decided to slander against the then-President Mohamed Nasheed. In a closely knit Islamic society such as ours, an accusation of working against the nation’s religion, which is what binds us together, is a matter of supreme importance – more so, if such an accusation is made against the nation’s President. If backed by proof, then it is a matter of strategic importance for the nation’s institutions to investigate but if it is unsubstantiated, it is slander of the most deplorable nature and must be handled with utmost urgency. In this case, it was interesting to note that while Dr Jameel made these allegations, they came from the political leader of a party whose other major leader, Dr Hassan Saeed, had declared during many election rallies in 2008 that as Gayoom’s Attorney General, he was aware that Nasheed was investigated for his association with western churches. He had declared during these rallies that Nasheed had come totally clean after detailed investigations. Moreover, Nasheed’s government was accused of voting in favour of Israel at the United Nations, whereas Maldives’ voting in any UN resolution is public knowledge and clearly this accusation was untrue as well. However, despite these issues being common knowledge, a political leader could believe that he could make the most serious and slanderous allegations against the President of the nation and could expect to be let off the hook easily for such slander. 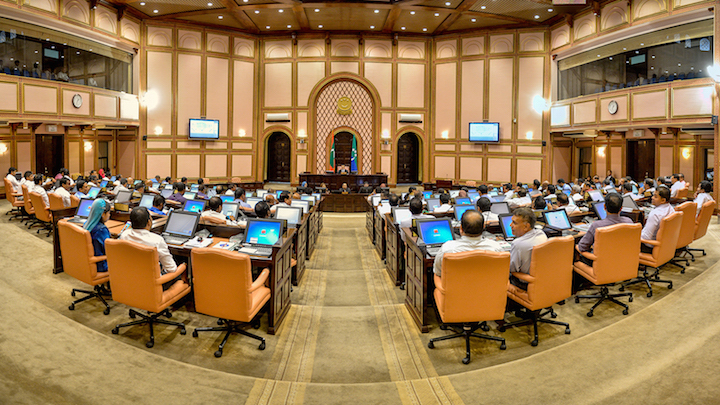 It’s another matter that there are a number of structural issues with respect to the judiciary in the Maldives which also played their part in how this case snowballed into significant political turmoil for the country. While I do not intend to comment on or discuss the issue of judicial reforms through this article, the core issue that I want to highlight is that even the laws must have had loopholes for which a political leader such as Dr Jameel had hoped to get away with slander. I say this because, had the laws been specific and if they had enough teeth to be deterrents by themselves, scope of judicial manipulation would have been limited in this case. For instance, while slander and libel were decriminalised in 2009, the maximum penalty for civil action against slander was set at MVR 5000 (US$325). That’s hardly a deterrent for a man who is known for his panache for Hugo Boss suits! He may as well have deposited MVR 5,000 in the President’s office in advance for every time he got a set of these ‘slanderous’ booklets printed! This saga that set off arguably the biggest political turmoil in Maldivian history was not the end of it, as for the woes against weak defamation laws. Foreign investors like Nexbis and GMR complained of continuous undermining of their business reputation through unsubstantiated and irresponsible corruption allegations by local politicians such as Sheikh Imran and Hassan Saeed. For instance, in the case of GMR, while the likes of Sheikh Imran and various ministers in Dr Waheed’s cabinet made corruption allegations against the GMR deal, the Anti-Corruption Commission later gave a clean chit to the deal. The impact that these experiences, with respect to the safety of investment climate and investor protection against local political interests, of these two foreign companies will have on future investment flows only remains to be seen in the times to come. What is very clear is that re-looking at defamation laws is not only important from a socio-political perspective but from an economic development and foreign investor protection perspective as well. In essence, we have come a long way from pre-2009 days when criminal defamation was widely abused but are now at a place where anyone can make any sort of irresponsible allegations without worrying about the consequences. This is not only limited to the domain of politics but to our economy as well as everyday life. It is clear that defamation cannot go back to being a criminal offence but it is also important for us to consider if the current civil defamation laws reflect the desired balance that is important to maintain order in our society. Clearly, the current laws are unable to make this balance and need to be strengthened – how, though, is a matter of broader socio-politico-legal debate. The National Planning Council has approved the State Trading Organisation (STO)’s plan to build an oil storage facility on an unidentified island in the north’s Haa Alif atoll. The facility would cover 600 square metres and contain over 200 tons of oil, reports Haveeru. It is said to be 10 times the size of a similar facility at Funadhoo. STO’s Managing Director, Shahid Ali said studies show the project would benefit the Maldivian economy. He said it has already drawn the interest of foreign investors. The project is awaiting approval from the Cabinet.